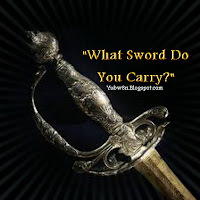 What Sword Do You Carry? “Yes, the edge of hatred is still hatred & it cuts deeply with harsh words, abuse & pompous self righteous behavior. So, for just a moment imagine that this child was your child. Open the door of your mind, & sweep out the dust of ridicule & self righteous bigotry. Attempt to see the message for what it is...prejudice & bullying from a perspective you may find...interesting. Do we not see that all form of hatred is wrong? Pray for the hearts of our children that they will not continue the breeding of a disease known as 'disrespect for life'. Far too many people have camouflaged themselves regarding 'equality for all within our society' for fear of rejection. Yet, willingly & pridefully applaud the pain of another in order to be accepted in the mainstream with the 'puffer fish of phoniness'. For the injured spirit is disrespected for being themselves & are bearing the scars. These wounds are often caused by the edge of hypocrisy’s sword while being withdrawn from the character of another. Do we not see that all form of disrespect for life is wrong? No one has the right to harm or judge. Hatred is still hatred no matter how many ‘amens’ you mutter on Sunday morning. Hypocrisy is one's claim for credit where none is worthy. Accepting does not mean condoning. Our Lord associated with everyone & related His love to everyone. Does this not mean we are to do likewise? Where your heart is ~ is where it is. 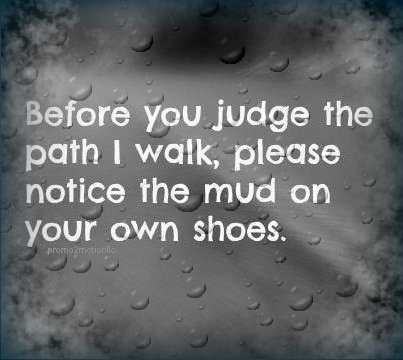 So, draw the line in the sand of your own consciousness ~ you that have no sin yet wish to cast the first stone. Oh, do be very careful not to drop that stone on your own foot." “Come to Me, all you who labor & are heavy-laden, & overwhelmed, & I will cause you to rest. Whatever burden you have to carry, God will shoulder the better part of it. God will take the greater portion of your struggle upon Himself. He will bear the extra weight & move with you to resolution. 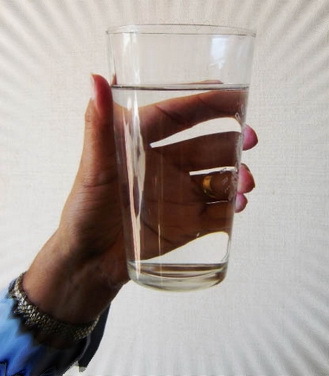 Imagine holding a glass of water & wondering how much it weighs. You don’t know, but the longer you hold it, the more it seems to weigh. Hold it for a minute, & its okay. But hold it for ten minutes & your arm begins to ache. Hold it for an hour & you may need to call an ambulance. But if you take the glass of water to a table & set it down, everything is okay again. Whatever you are holding on to or simply carrying on your own strength...once you lay it down, let it go & ask God for His help, His strength, His guidance...your spirit will be filled with His peace. God will take your burden off your back & give you rest.